Hello friends! I must apologise for taking such a long time to write this post - especially considering it's been a month (time flies, my goodness!) since we left for our trip. But that was then and this is now and here I am, ready and raring to write this post! Sam and I went to Melbourne for six nights in April to celebrate our birthdays, and it was so wonderful! We had a week filled with delicious food, fun adventures, and great people. In fact, we ate so much good food that I intend to write a separate post dedicated to it, but for now I'll stick to where we stayed and what we did! There's a lot of photos so I'll pop this post under a cut. Because it was a special occasion (and I found a 40% off deal), Sam and I decided to splash out and stay at the Crown Promenade, and we were not disappointed. Our room was on the 23rd floor, with a huge window and an amazing view over the Yarra. It was easily the most comfortable room I've ever stayed in, it had Cartoon Network and being Easter weekend, there were a LOT of Adventure Time marathons, so on the couple of days that we were rained in (of course, it is Melbourne after all) we always had something to do! The first full day we were there was Good Friday so we spent most of the day just hanging out at the hotel seeing as nothing was open, so it was a bit nondescript but it was also nice to adventure around a new place - even if most of the stores in the complex were closed. BUT we were able to locate the nearest 7/11 which had a fully stoked Ben & Jerry's fridge - hallelujah! Stores in Adelaide have only just started stocking Ben & Jerry's over the last week or so, so every time we've been interstate we stuff ourselves and regret nothing. We also did a pretty ridiculous amount of shopping while we were there, which was made even more impressive by the fact that Sm rarely ever shops so when we came back from the South Wharf DFO and he had something like four full shopping bags we sat back and just went "wow, how?". I also paid the Dangerfield outlet in Fitzroy a visit with my old friend Ellie and bought a whole lot of amazing things - including a pair of pants! I never buy pants! Praise pants! I also snagged a Vans x ASPCA collab dog backpack from the South Wharf Vans store, which I am so crazy stoked on. I rarely use a backpack, but now I'm looking for excuses to take it places as much as i can haha. We went to ACMI to see the Dreamworks exhibition with Ellie and her lovely partner James and it was so much fun! I'm more of a Disney fan myself, but it was really interesting to see all of the processes that go into creating a Dreamworks feature - it's incredible how much work is in those films. There were so many different and amazing things in that place, I love film and there's no where really like that in Adelaide, so it was a really great place to visit. I especially loved that they had Daisy Buchanan's dress from Luhrmann's Great Gatsby and a clay model of Max from Mary & Max on display. Sam and I spent the last morning of our trip at the Aquarium. It was pretty much the same as the one in Sydney, except that there was a penguin enclosure which was probably my favourite part - there was a bunch of fluffy little penguin chicks and they were so cute! They mostly just stood around huddled up to their mothers, but I would've done the same because it looked pretty cold in there. Oh, and one last thing - I also got a new tattoo! 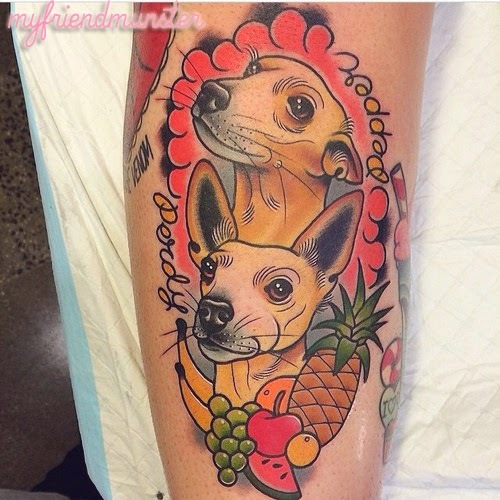 My appointment with the amazingly talented Clare Hampshire at Korpus in Brunswick finally rolled around and she put my two favourite girls on my leg for life - complete with her trademark fruity flare. I'm so in love with it, I'm so happy that I'll be able to carry them with me forever now. Ain't they just the cutest? Clare was wonderful to work with, she's super easy to talk to and made me feel so comfortable - and she has so many cool things to look at around her work station! The gaps in my leg are slowly being filled and it's so exciting. I can't wait until there's no blank skin left on it. I want to look like i'm wearing half a pair of pants all the time! 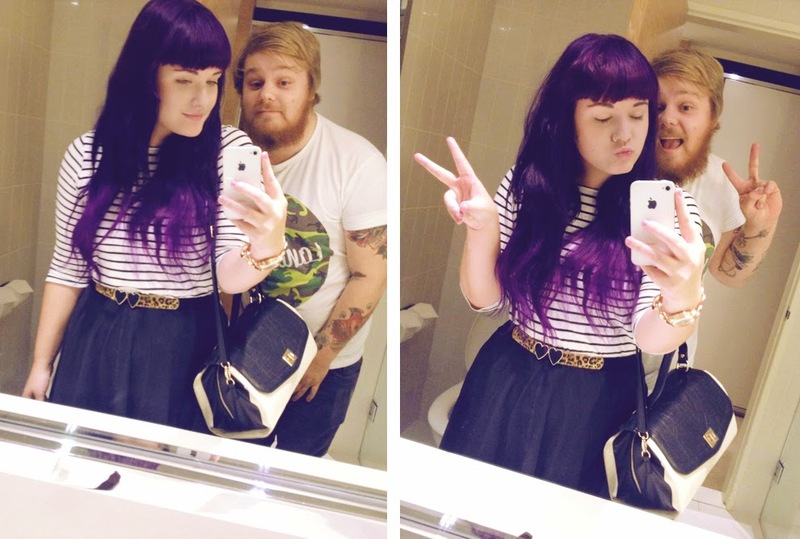 Despite the kind of ridiculous length of this post, it's a pretty short summary of our week away. Where's your favourite place to travel too? And if it's Melbourne, what's your favourite thing to do there? 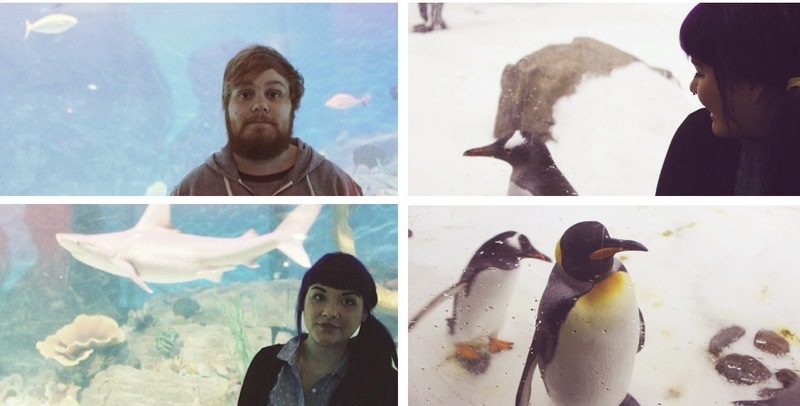 Aren't the penguins at Melbourne aquarium SO CUTE! I'm used to only really seeing fairy penguins, so when I went to Melbourne Aquarium and came across the Emperor penguins I was so chuffed! Oh! I'm hoping to get a tattoo by Clare when I'm down in Melbourne next (i'll be there for 6 weeks). It's my first tattoo, but I want to get a memorial for my dog and I've just loved the animal portraits she's done. Looks like an awesome weekend! I'm in Melbourne almost every other day for uni but I never seem to make time to go and see the sights, it's a definite must-do.